A frequent question asked and to be approached as a complete project overview and not just a liquid screed floor. Having worked in the construction industry for a considerable amount of time I am going to back track to my earlier days as an apprentice, to have a better understanding of what procedures need to be followed to create the fastest drying times for the project. What we used to do when arriving on site at the start of each day irrespective of your trade, i.e. plumber, carpenter, plasterer, electrician, your first job of the day would be to open all doors and windows if it was not raining. This allowed air movement throughout the building, a change of air allowed any moisture absorbed in the atmosphere to be replaced with fresh air, capable of absorbing moisture. Think of the atmosphere as a sponge; a dry sponge traps water and when saturated the water passes through the sponge. Another analogy to consider is the wet tee-shirt test. If you were to place on a washing line a wet tee-shirt on a wet day it will not dry; put the wet tee-shirt on a washing line on a dry windy day and the tee-shirt will dry. How can we apply this practice to the drying of screed and in particular the drying of a complete building environment? Modern buildings are designed with little air movement due to the high levels of insulation required to comply with Part L Building Regulations. This ultimately results in the building retaining high levels of moisture during the construction process. When dew point takes place the moisture/water vapour condenses out of the atmosphere and being heavier than air this inevitably lands on the floor slowing down the drying of liquid screed. The ideal practice is to record moisture levels using a combined hygrometer and thermometer. Check the inside air temperature and relative humidity and the outside air temperature and relative humidity, subject to a differential between these measurements you would either open up the windows and doors to create an air change or you would keep the windows and doors closed to prevent the ingress of damp air. During winter months there is less opportunity for natural drying times due to the damp and cold weather conditions and this will impact on the overall drying time of the property as a whole and not just the liquid floor screed. Although as this moisture migrates downwards it is often assumed that it is the liquid screed that is responsible whereas the reality is that all of the moisture ends up on the floor and keeps the screed damp. Good site practices are required from the time the shell of the building is erected i.e. once the roof is on it is ideal for the windows and patio doors to be installed to render the construction water tight. An alternative to this would be to fit temporary doors and glazing, for example place polythene sheeting over the window apertures. Thermotech liquid screed installers have worked on many properties that have been exposed to adverse weather conditions during the construction process resulting in internal timbers and walls being saturated, and it is clear from the image below how much condensation is on the internal walls even before the liquid screed has been pumped. 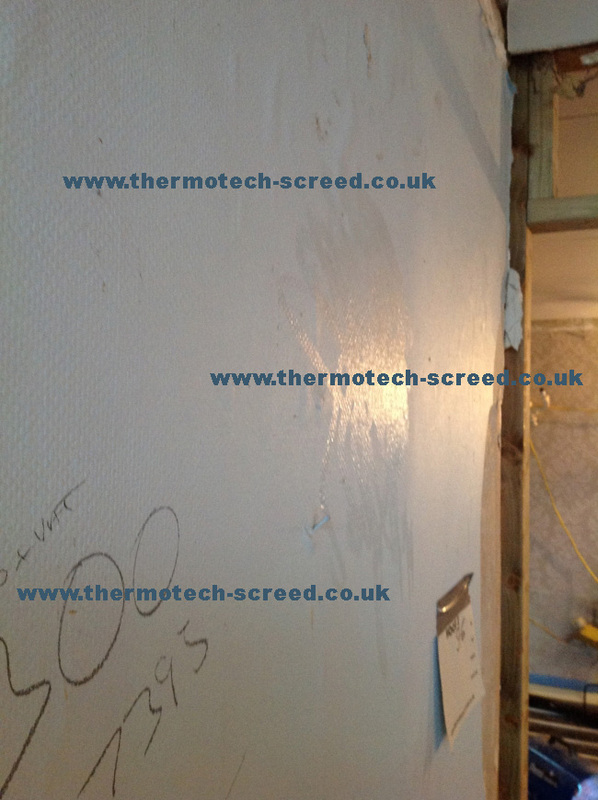 When a building is eventually closed up this moisture is trapped within the structure, including the walls and the floors, and will lead to numerous problems including the extended drying times for floor screed and plastering, mould formation and difficulties with floor and wall coverings not fully adhering. 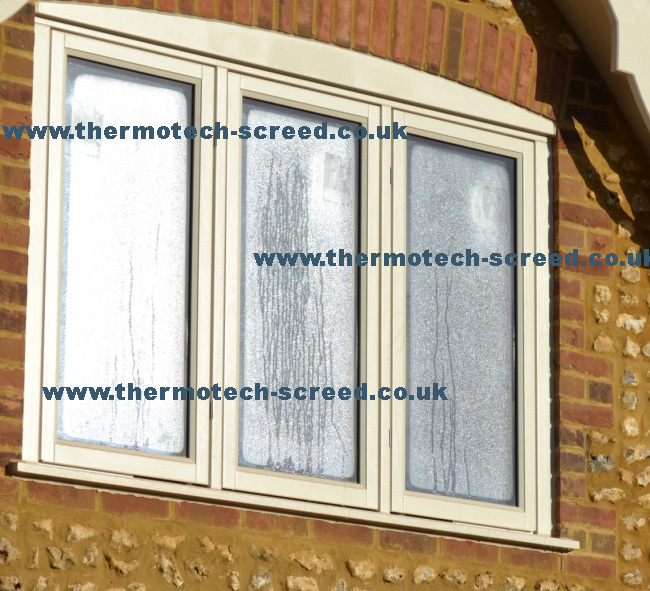 Prior to liquid screed pumping, the photgraph below shows that there is a considerable amount of moisture, water vapour, visible on the internal window surfaces. This was taken by a Thermotech Team Leader at around 09.00 on a March morning. record inside and outside air temperatures and relative humidity. In this instance an air temperature of 6.9 degrees Centigrade with a relative humidity of 86% were recorded inside, and the respective outside readings were 5.8 and 81%. As you can see from this window there is considerable condensation which has been released overnight. To reduce drying times the moisture needs to be removed from the property, how can this be achieved? To start with the building must be watertight as soon as possible. Do not store wet or damp building materials within the building or the work area. Minimise the transfer of mud and dirt and water from the outside into the building by using disposable mats or cardboard at entry points. Use dehumidifiers to speed up the drying process and reduce the moisture content within the building. Remember dehumidifiers work best in a sealed environment i.e. keep all windows and doors closed and seal up any aperture to the outside. Essentially a dehumidifier is a freezer with a fan and a drain channel. The fan circulates air over a freezing element (evaporator) and any moisture that passes it freezes. The dehumidifier runs through a duty cycle and goes into defrost mode turning the ice into water that then drains to the outside via a hose connection. If it drains into a bucket within the building then bucket must be sealed to prevent the water returning to the atmosphere. an industry tip is to use a high velocity fan to create air movement, either with or without a dehumidifier, and accelerate the drying of liquid screed. Note that conventional floor screed should not be subjected to accelerated drying as it may induce cracks and other weaknesses. With Thermotech’s range of liquid screed products we can also utilise underfloor heating systems to assist the drying process. The underfloor heating can be commissioned as early as seven days after the placing of liquid screed but remember the moisture generated by this process has to be removed from the building, as above, otherwise you will create a continuous cycle of evaporation and condensation. Thermotech screed installers will always leave a post installation information sheet on site for client reference. All Thermotech Team Leaders have the expertise, knowledge and the know how to give sound onsite advice regarding post installation procedures for liquid screed.